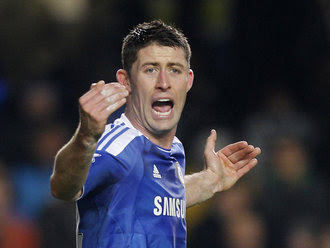 Gary Cahill received a second penalty assessed Manchester United to change the direction of the game. Chelsea defender Gary Cahill was disappointed with Howard Webb's decision to give Manchester United a second penalty in a match that ended early this morning (06/02) at Stamford Bridge. As you know, United have two successful penalty in execution by Wayne Rooney in a match that ended with the score 3-3. But Cahill assess the penalty should never have happened. "We felt like a defeat in the locker room. Conceded a penalty of two things that are not profitable. Second penalty I think is not valid. I think it made us miss a crucial moment in time," said Cahill. "At the moment I do not think it's a penalty and when I saw the replay, I do not change my mind." "It's disappointing [the referee gave the penalty for United] because it changed the direction of the game. Penalty to make the position to be 3-2. Suddenly they exert all their abilities, so you are in a greater pressure." "If the penalty is not given then the position is still 3-1 and we have a better chance to win the game but I think Webb is a fantastic referee. I think he is one of the best.